The S&P BSE Sensex ended 46 points lower at 24,824 and Nifty50 settled at 7,555, down by 8 points after hitting intra-day high of 7,600.45. 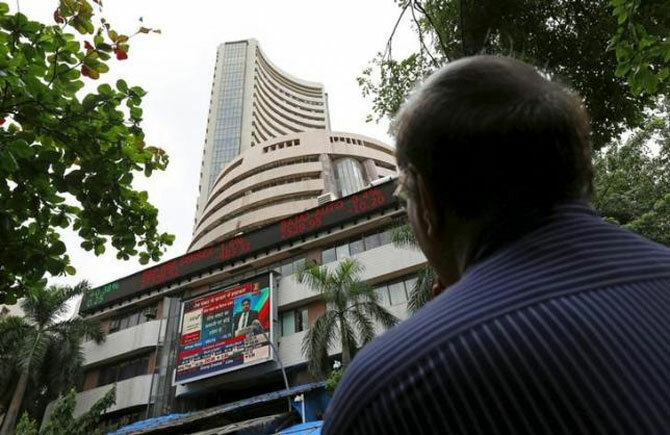 Benchmark indices started the new month on a tender note as investors turned cautious ahead of the Reserve Bank of India’s monetary policy review on Tuesday. The central bank is widely expected to maintain status quo thus adding pressure on banking and financial shares. The broader markets, however, outperformed their larger peers with BSE Midcap and Small cap indices ending higher between 0.3% - 0.6%. "World’s leading central banks are rushing to provide support to financial markets. The FOMC has maintained status quo awaiting stabilization in the global financial markets. While ECB has indicated it will increase liquidity by March, Bank of Japan has lowered the interest rate to negative -0.10% and PBOC is pushing funds into inter-banks system. Now its RBIs turn to navigate amid the pressure. Though the consensus expects a status quo awaiting the Budget, we should not be surprised to see positive news either by increasing the Open Market Operations or by lowering SLR or interest rates," said Vinod Nair, head of fundamental research at Geojit BNP Paribas Financial Services in a note. Among the macro-economic activity, manufacturing data expanded for the month of January, thus registering a four-month high growth following inflows of new business from both domestic and export sources, according to a Nikkei purchasing managers' index (PMI) survey. PMI firmed up to 51.1 points in January 2016 from 49.1 in December 2015. The rupee is trading flat against the US dollar at Rs 67.78 on sustained bouts of dollar selling by banks and exporters amid lacklustre domestic trades. Oil prices ceased their ascent, hurt by the strengthening US currency which makes the dollar-price commodity more expensive. Brent crude for April was trading 53 cents lower at $35.46 a barrel. Maruti Suzuki ended down nearly 4% after the country’s largest passenger car-maker reported a 2.6% decline in total sales in January 2015 at 113,606 units, due to lower export sales. The company had sold 116,606 units in the same month in 2014. The auto company also cited lower number of working days reason for dip as one of the reasons for the dip in sales. Eicher Motors' Royal Enfield reported a 65% jump in total motorcycle sales at 47,710 units last month as against 28,927 units in January, 2015. The stock ended up by 3%. Ashok Leyland registered 30.5% increment in total sales at 13,886 units in January. The stock ended 2% up. ICICI Bank finished lower by 5.5% after the bank’s asset quality saw a sharp decline with gross NPAs escalating to Rs 6,500 crore as against an average of Rs 2,400 crore in last four quarters. SBI,Axis Bank, HDFC dropped 0.1-4% each. Dr Reddy's Laboratories (DRL) has received tentative approval from the US health regulator for anti-biotic Zenavod, indicated for the treatment of a type of chronic skin disease in adult patients. However, the stock reacted negatively to finish 2% lower. L&T gained 1.6% after the engineering major reported a 19% increase in consolidated net profit for the third quarter on the account of improved execution of projects in its overseas. Petrol price was today slashed by a marginal 4 paise a litre and diesel by 3 paise a litre as the government raised excise duty to deny consumers full benefit of falling international oil prices. The OMCs finished mixed with BPCL, HPCL ending between 1.5-2% lower while IOC, OIL ending up between 0.5-1%. Three major Indian IT companies -- Infosys, Tata Consultancy Services and Wipro -- have joined US President Barack Obama's ambitious computer science for all initiative as part of a public-private collaboration, pledging thousands of dollars in grants. Shares of these companies gained between 0.3-1% each. Shares of IPCA Laboratories were down nearly 5% at Rs 638 on the Bombay Stock Exchange after the company said that it has received an warning letter from the US Food & Drug Administration for its manufacturing units located at Ratlam (Madhya Pradesh), SEZ Indore (Pithampur) and Piparia (Silvassa). Glenmark Pharmaceuticals soared 2.89% after HSBC upgraded the stock status to ‘Buy’ from ‘Hold’, as per media reports. Jet Airways said today that it will offer wireless streaming of in-flight entertainment on its Boeing 737 planes from second quarter of 2016. Asian stocks ended on a cautious note as Bank of Japan’s stimulus moved provided respite; however, weakness in China dented the sentiments. China's Purchasing Managers' Index (PMI) contracted at its fastest pace in almost three-and-a-half years in January, missing market expectations, and marking the sixth consecutive month of factory activity contraction. Japan’s Nikkei ended up by 2% while Hang Seng and Shanghai Composite finished 0.4% and 1.8% lower respectively. European markets also started on a cautious note with major indices down between 0.5-1% each.